Submission for entries to Everyone's Vision Petron: Lakbay Pinoy, a national student art competition, is set for Monday, 25 July 2011. Themed Lakbay Pinoy —Journeys to Remember, Pathways to Rediscover, this year’s competition focuses on life journeys expressed symbolically by roads, highways and byways. It can be a mountain path representing a journey to success, or a zigzag lane symbolizing seasons of change. It can be a forest trail sparking childhood memories, or a nostalgic route conjuring reminiscences of student life. 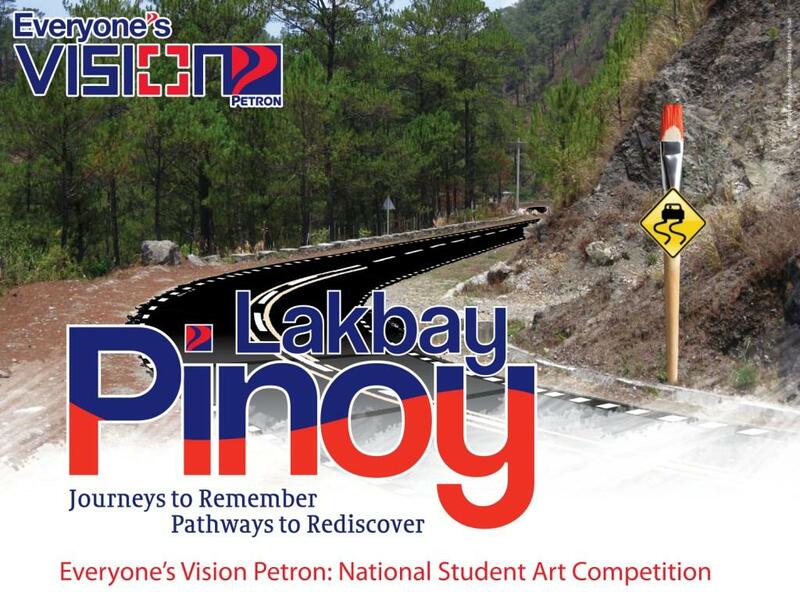 Everyone’s Vision Petron is open to all talented students enrolled in a regular university or college course, or in tutorial and photography classes. Student artists may compete in three categories: Painting (oil and water-based media), photography, and t-shirt design. In the painting category, six Grand Prize winners will each receive P50,000; for the colored photography category, six Grand Prize winners will each receive P30,000; and in the t-shirt design category, three Grand Prize winners will each receive P30,000. All Grand Prize winners will also receive a trophies and plaques made by National Artist Napoleon V. Abueva. All Runners-up will get trophies. Entries may be submitted to the Secretariat Office (c/o Studio 5 Designs, 28 Paseo de Roxas cor. Jupiter St., Bel-Air Village, Makati City, telephone 632-8909318).